Large igneous provinces (LIPs) on Earth are commonly thought of as huge deposits of effusive volcanic products emplaced regionally, over a relatively short period of time, and being closely linked to mantle dynamics, such as upwelling plumes or anomalous hot spots (e.g., Coffin and Eldholm, 1994). Examples of LIP settings include continental flood basalt provinces, oceanic plateaus, volcanic margins, ocean basin flood basalts and large seamount chains. On Earth, the presence of plate tectonics operates to define, modify and obscure many LIPs environments. For example, upwelling plumes at divergent plate boundaries (e.g., Iceland) produce considerably different deposits than do mid-plate plumes (e.g., Hawaii). LIPs are common on most of the terrestrial (Earth-like) planets (e.g., Earth, Moon, Mars, Venus), but are often manifested differently and occur in different environments (e.g., Head and Coffin, 1997). Two key aspects of the planetary record help to provide insight into the origin and evolution of LIPs: 1) several planetary bodies other than the Earth (e.g., the Moon, Mars and Mercury) preserve a rich surface geologic record of the majority of Solar System history, and 2) these same bodies are one-plate planets, and thus their lithospheres have been stable relative to their interiors over the vast majority of their history. These facts mean that the Moon, Mars, and Mercury not only preserve an excellent record of LIPs in space (their areal distribution over the planet), but this record is also preserved in time (the temporal flux of volcanism over geological history). On Earth, estimates of volcanic flux over geological time must come from painstaking correlation of disparate and often widely spaced and incomplete stratigraphic sections and careful dating of key marker horizons or igneous rocks. And of course because of the dynamic nature of the Earth, the record is increasingly sparse as one progresses back into earlier Earth history. So, the question arises: What has the magmatic flux of the Earth been in its past history? Was there ever a time when the global flux was so great that much of the Earth, and perhaps even the whole planet, might be regarded as a Large Igneous Province? Most thinking about the Earth's magmatic record assumes an early very high heat flow related to loss of accretional heat and early radioactive decay, followed by a monotonic decrease to present heat flux levels. Was the early Earth, then, a global LIP? Was the heat flux decay smooth, or were there major peaks? How was magmatism (volcanism and plutonism) manifested in these scenarios? Evidence about terrestrial planet global heat flux trends and planetary-scale volcanic records can be found on the Moon and Mars. In an earlier LIP of the Month (April 2005) the concept of the lunar mare basalt volcanism emplacement phase as a Large Igneous Province on a one-plate planet was presented (Head, 2005). In the lunar example, mare volcanism peaked early in the Imbrium Period (which extends from about 3.8-3.2 Ga) and then was volumetrically insignificant for the last half of Solar System history. On Mars, volcanism was also more volumetrically significant and areally widespread during early history. The purpose of this contribution is to examine the period of peak volcanic flux on Mars (Early Hesperian-aged ridged plains volcanism) (Figure 1), assess whether it might qualify as a global Large Igneous Province, and to reflect on the implications for Earth history. 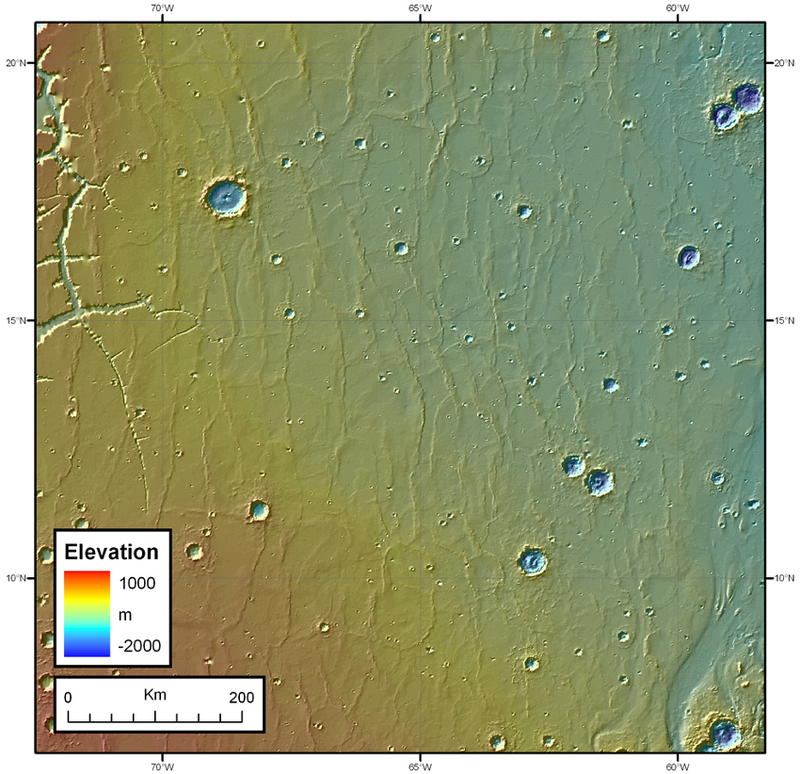 Figure 1: Topography and ages of surface units on Mars. A. Map of the surface units on Mars (Greeley and Guest, 1987; Scott and Tanaka, 1986; Tanaka and Scott, 1987) grouped together on the basis of age (see Figure 2). Areas in white are impact craters and their ejecta deposits. 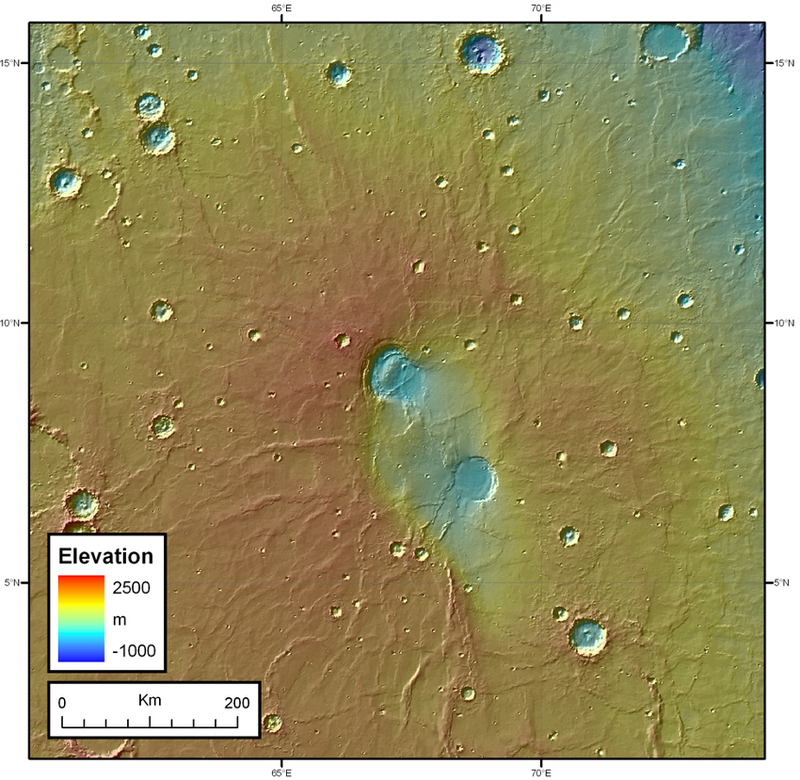 B. Topographic map of Mars derived from Mars Orbiter Laser Altimeter (MOLA) data with major features located. Modified from Solomon et al. (2005). The geological history and relative time scale of Mars has been established through geological mapping, and superposition, embayment and cross cutting relationships. 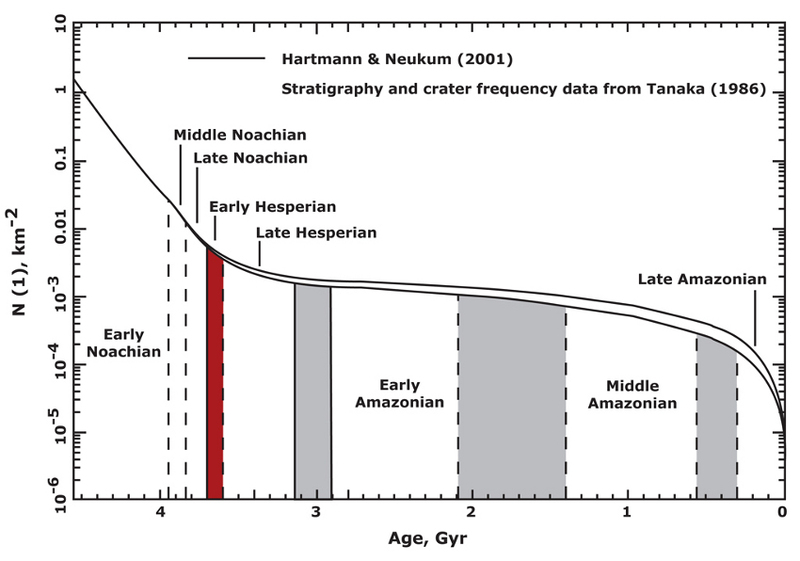 The absolute time scale derives from the density of superposed impact craters on the different units, calibrated with radiometric dates of samples from known locations on the Moon, extrapolated to the Mars environment and conditions (e.g., Hartmann and Neukum, 2001) (Figure 2). The oldest period of Mars history is the Noachian, beginning at the origin of Mars and extending to ~3.9 Ga, followed by the Hesperian, extending from ~3.9-3.0 Ga, and the Amazonian, from ~3.0 Ga up to the present. Figure 2: Mars cratering chronology, showing the major time periods, with the Early Hesperian highlighted in red (modified from Hartmann and Neukum, 2001). Global geological mapping of Mars has revealed a variety of units formed by a wide range of geologic processes, including impact cratering (dominating in the Noachian), volcanism (extending throughout the history of Mars), tectonism, fluvial, eolian, glacial, and polar processes (Greeley and Guest, 1987; Scott and Tanaka, 1986; Tanaka and Scott, 1987; Tanaka, et al., 1992; Head et al., 2001) (Figure 1). The global maps have also been used to estimate the relative importance of different geologic processes (Tanaka et al., 1992). Using the areas covered by the units and their thickness, the volumes of units have been calculated and their time scales assessed in order to estimate their relative significance and the fluxes represented by volcanic processes. The areas covered by units formed during these different periods (Figure 1a) shows that the old Noachian crust was heavily modified by impact cratering, that Hesperian-aged volcanic, and fluvial activity resurfaced much of the planet, and finally, that resurfacing waned during the Amazonian, with volcanism dominating at the Tharsis and Elysium regions (Figure 1b). Volcanic rocks are estimated to cover about 60% of the surface of Mars and to consist of lava flows and pyroclastic deposits, with older deposits having fewer recognizable landforms due to impact disruption and mantling by younger units (Tanaka et al., 1992). Specific features recognized as volcanic include lobate, flow-like features, edifices with a wide variety of morphologies and ranging up to hundreds of km in width and tens of km in height, elongate and circular vent-like features, sinuous rilles representing lava thermal erosion, and mantling blankets interpreted to be pyroclastic in origin (e.g., Greeley and Spudis, 1981; Wilson and Head, 1994). The extent of the surface area resurfaced by volcanism as a function of time was calculated by Tanaka et al. (1992), who found that volcanic resurfacing has generally decreased in importance as a function of time from ~1 km2/a in the Middle Noachian to ~10-2 km2/a in the Late Amazonian. Coincident with this decrease, volcanism evolved from globally pervasive in the Noachian and Early Hesperian, to locally important in the Amazonian, with activity focused in the Tharsis and Elysium regions. Following a high in the Early and Middle Noachian, presumably related to initial crustal formation processes, the plot of volcanic resurfacing shows a decrease in the Late Noachian, and an increase again in the Early Hesperian, before continuing a downward decrease to the present (Tanaka et al., 1992; their Figure 6). What are the geologic units and their significance in the Early Hesperian? The most prominent unit emplaced during that period is Hesperian Ridged Plains (Hr), described on the global geological maps (Greeley and Guest, 1987; Scott and and Tanaka, 1986) as characterized by "broad planar surfaces, rare lobate deposits, and long parallel to sinuous mare type (wrinkle ) ridges about 30-70 km apart" (Figure 3) that forms plains within and outside craters throughout the uplands plateau area and in some lowland plains regions. The Ridged Plains were interpreted by the global mappers to be "extensive lava flows erupted with low effective viscosity from many sources at high rates; ridges are either volcanic constructs or compressional features." Detailed mapping and analysis since the late 1980's has shown that the wrinkle ridges are tectonic, and not volcanic in origin (e.g., Watters, 1993; Mueller and Golombek, 2004), and that they formed perhaps simultaneously, but largely immediately after the emplacement of the lavas forming the regional plains (e.g., Mangold et al., 1998). Although there are generally simultaneous central source regions in several regions of Mars (e.g., Hadriaca Patera, Crown and Greeley, 1993; Tyrrhena Patera, Greeley and Crown, 1990; Gregg and Farley, 2006; Apollinaris Patera, Robinson et al., 1993; and Syrtis Major, Hiesinger and Head, 2004; Alba Patera, Ivanov and Head, 2006; Figures 4, 5), the vast majority of the Hesperian Ridged Plains unit is not characterized by obvious individual sources, and this is one reason it has been thought to have been emplaced in widely distributed sources in a flood-basalt mode. Another significant concentration of Ridged Plains is in the Tharsis region of Mars, a huge broad dome rising about 10 km above the surrounding plains (Figure 1) that is also the focus of major tectonic features on Mars. The southeast (Thaumasia) and eastern (Hesperia Planum) parts of Tharsis are clearly formed of Hr, as are other portions on the flanks and surrounding Tharsis, and underlying the younger Amazonian-aged lavas higher on the rise. Furthermore, the huge Alba Patera volcanic edifice is the site of voluminous eruptions during this time (e.g., Ivanov and Head, 2006). Figure 3: Hesperian Ridged Plains (Hr): MOLA shaded relief map of Lunae Planum, showing smooth nature of the regional plains and their superposed wrinkle ridges. 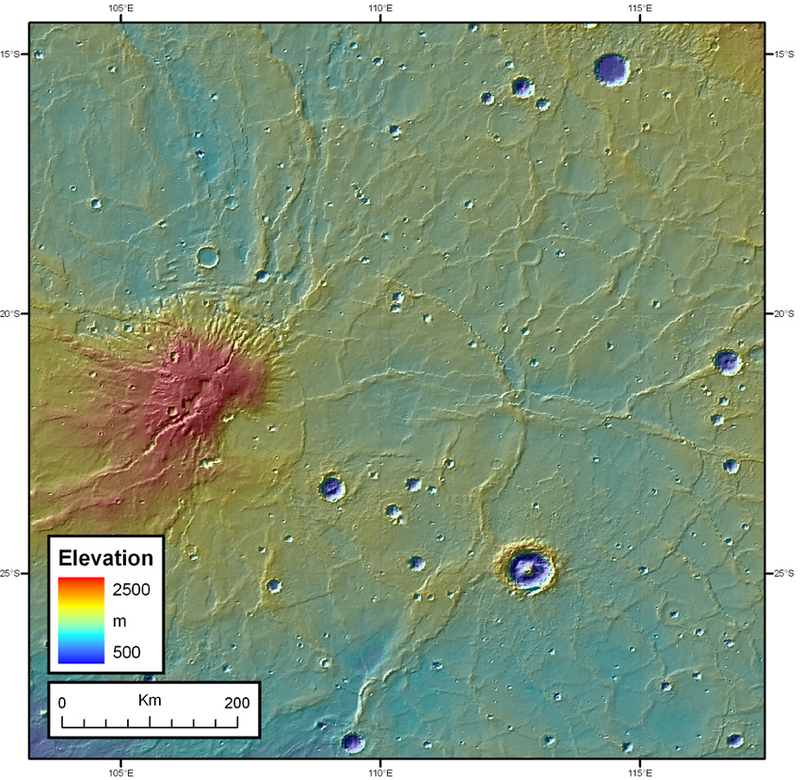 Figure 4: Hesperian Ridged Plains (Hr): MOLA shaded relief map of Syrtis Major Planitia, showing the large calderas (center) and very low broad edifice that is the source region for some of the regional plains. Superposed wrinkle ridges are readily seen. Figure 5: Hesperian Ridged Plains (Hr): MOLA shaded relief map of Hesperia Planum, showing Tyrrhena Patera (middle left), the source region for much of the surrounding smooth regional plains; also note extensive superposed wrinkle ridges. Geological mapping of the northern lowlands shows that it is largely covered by the Vastitas Borealis Formation (Tanaka and Scott, 1987), a Late Hesperian-aged sedimentary unit interpreted to be the sublimation residue of outflow channel effluent (e.g., Kreslavsky and Head, 2002). 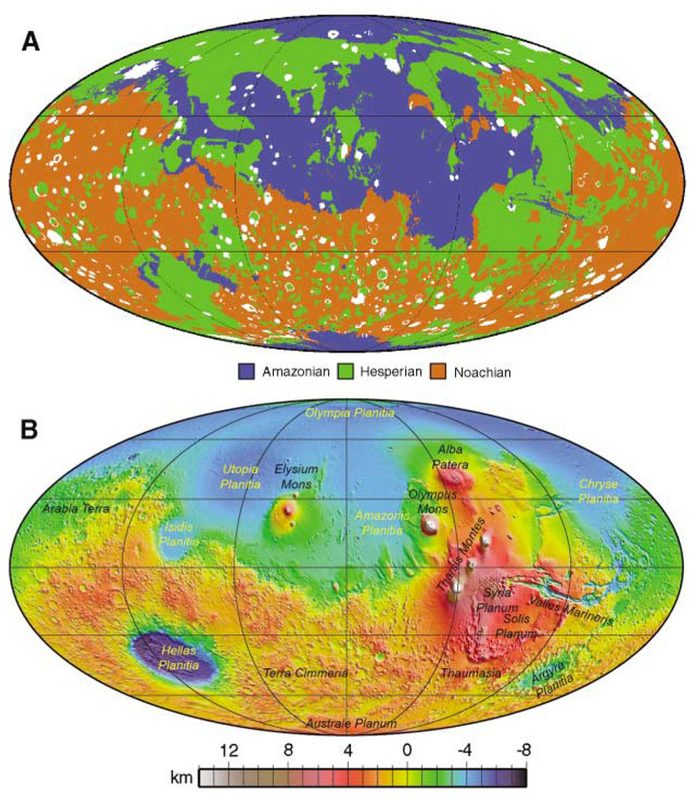 Detailed mapping using new spacecraft data, however, revealed that underlying this unit are extensive deposits of Hesperian Ridged Plains in the northern lowlands, the Utopia Basin, the Isidis Basin and the Hellas Basin (Head et al., 2002). Indeed, the recognition of these deposits brought the area of Mars resurfaced during the Early Hesperian to about 30%, or a total area of about 43.5 x 106 km2. Using average thickness estimates, the volume of the Hesperian Ridge Plains is estimated to be of the order of 3.3 x 107 km3, representing a significant increase over previous estimates. New data and analyses provide further insight into modes of emplacement. In addition to revealing details about the modes of emplacement of the distributed centers of volcanism (e.g., Hardiaca, Syrtis Major, Tyrrhena, Alba, Apollonaris, etc. ), the new high-resolution imaging and altimetry data have revealed relationships with the Ridged Plains and surrounding and underlying units. Among the additional units emplaced during the Late Noachian and Early Hesperian are fine-grained mantling units perhaps related to pyroclastic airfall from the centers of volcanism, or to the emplacement of dust and volatiles during periods of climate change (e.g., Moore, 1990; Grant and Schultz, 1990). Examination of the relationships of these units and Hr has revealed the presence of narrow ridges that appear to be exhumed dikes that were intruded into the shallow crust, feeding the flows of the Ridged Plains unit, and subsequently being exhumed (Figure 6). Head et al. (2006) recently documented the presence of two low, narrow and broadly arcuate ridges that extend for 600-700 km across the surface in western Terra Tyrrhena. These ridges crosscut Noachian terrain and are closely associated with the Early Hesperian ridged plains. These geological relationships suggest that the ridges represent the solidified magma-filled cracks (dikes) that fed the eruptions. Analysis of typical ridge widths (~700 m) and geometries are consistent with very high effusion rate flood basalt eruptions, similar to the conditions interpreted by earlier workers on the basis of the deposit morphology. Figure 6: Distribution of ridges northeast of Huygens crater on the northern rim of the Hellas Basin. A. Thick lines show where the two linear ridges have been mapped. Letters show locations of images B-H, which show various relationships of the ridges, interpreted to be exhumed dikes related to the emplacement of the Hesperian Ridged Plains, to adjacent terrains. From Head et al. (2006). North is up in all images. In summary, the Hesperian Ridged Plains are very significant on Mars in terms of their global distribution, their huge volume, and their anomalously high flux. Much of the volcanism occurred during the Early Hesperian, currently thought to have had a duration of about 100 million years (Figure 2). The Ridged Plains formed in association with widely distributed centers of volcanism, very widely distributed and abundant regional plains areas (the northern lowlands, Tharsis), and huge numbers of patches of flood-basalt-like lavas emplaced on crater floors and other low-lying areas. Their emplacement was followed by the extensive development of contractional wrinkle ridges. The geological record of Mars strongly suggests a major increase in magmatic flux in the Early Hesperian period, sufficient to think of this phase as a "global" Large Igneous Province (GLIP), that is, an event that represents a major change in the mean planetary flux over the planet as a whole, rather than the more traditional definition of LIP, which is a localized region of anomalously high magmatic flux. The consequences of GLIPS are likely to be the same as those of LIPs, in the sense that 1) they will represent an enhanced period of volatile outgassing that could have strong influence on climate change (e.g., Phillips et al., 2001), and 2) they will represent, or be caused by, significant perturbations in mantle convection patterns, heat flux patterns, and attendant crustal deformation. What might cause such a perturbation so early in planetary history? One possibility might be related to the nature of early crustal differentiation. On Earth we are accustomed to thinking in terms of a segmented and dynamic lithosphere (plate tectonics) characterized by lateral crustal accretion (at divergent plate boundaries) and destruction (at convergent plate boundaries). On the one-plate planets Moon, Mars and Mercury, early crustal accretion and differentiation is thought to have been dominantly vertical, not lateral as we currently see on Earth. One consequence of vertical accretion and differentiation is the production of global chemical and thermal layering. Some of these configurations contain vertical density instabilities that can result in negative buoyancy, and foundering and overturn of the vertical sequence. A commonly modeled aftermath of the foundering and sinking of these denser layers is their replacement by deeper, hotter, fertile mantle, (e.g., Hess and Parmentier, 1995, 2001; Elkins-Tanton et al., 2003), potentially leading to major phases of decompression melting and volcanic flux. Could the early, pre-plate-tectonic Earth have been characterized by vertical crustal accretion and overturn, leading to a Global Large Igneous Province? Could such a foundering event have led to the beginning of subduction and the initiation of plate tectonics? New insights into early Earth history, combined with an improved understanding of the record and history of Earth-like planetary bodies (Moon, Mars, Mercury, Venus) will help to address these questions in the next decade. Coffin, M. F., and O. Eldholm (1994), Large igneous provinces: Crustal structure, dimensions, and external consequences, Reviews of Geophysics, 32, 1-36. Crown, D. A., and R. Greeley (1993), Volcanic geology of Hadriaca Patera and the eastern Hellas region of Mars, J. Geophys. Res., 98, 3431-3451. Elkins-Tanton, L. T., E. M. Parmentier, and P. C. Hess (2003), Magma ocean fractional crystallization and cumulate overturn in terrestrial planets: Implications for Mars, Meteoritics and Planetary Science, 38, 1753-1771. Grant, J. A., and P. H. Schultz (1990), Gradational epochs on Mars - Evidence from west-northwest of Isidis Basin and Electris, Icarus, 84, 166-195. Greeley, R., and D. A. Crown (1990), Volcanic geology of Tyrrhena Patera, Mars, J. Geophys. Res., 95, 7133-7149. Greeley, R., and J. E. Guest (1987), Geologic Map of the Eastern Equatorial Region of Mars, USGS Misc. Inv. Ser. I-1802-B. Greeley, R., and P. D. Spudis (1981), Volcanism on Mars, Reviews of Geophysics and Space Physics, 19, 13-41. Gregg, T. K. P., and M. A. Farley (2006), Mafic pyroclastic flows at Tyrrhena Patera, Mars: Constraints from observations and models, Journal of Volcanology and Geothermal Research, 155, 81-89. Hartmann, W. K., and G. Neukum (2001), Cratering Chronology and the Evolution of Mars, Space Science Reviews, 96, 165-194. Head, J. W. (2004), Lunar mare basalt volcanism: Formation of Large Igneous Provinces (LIPs) on a one-plate planet, http://www.largeigneousprovinces.org/04apr. Head, J. W., and M. F. Coffin (1997), Large Igneous Provinces: A Planetary Perspective, in Large Igneous Provinces: Continental, Oceanic, and Planetary Flood Volcanism, edited by J. J. Mahoney and M. F. Coffin, AGU Geophysical Monograph, 100, p. 411-438. Head, J. W., M. A. Kreslavsky, and S. Pratt (2002), Northern lowlands of Mars: Evidence for widespread volcanic flooding and tectonic deformation in the Hesperian Period, J. Geophys. Res., 107a, 3-1; DOI: 10.1029/2000JE001445. 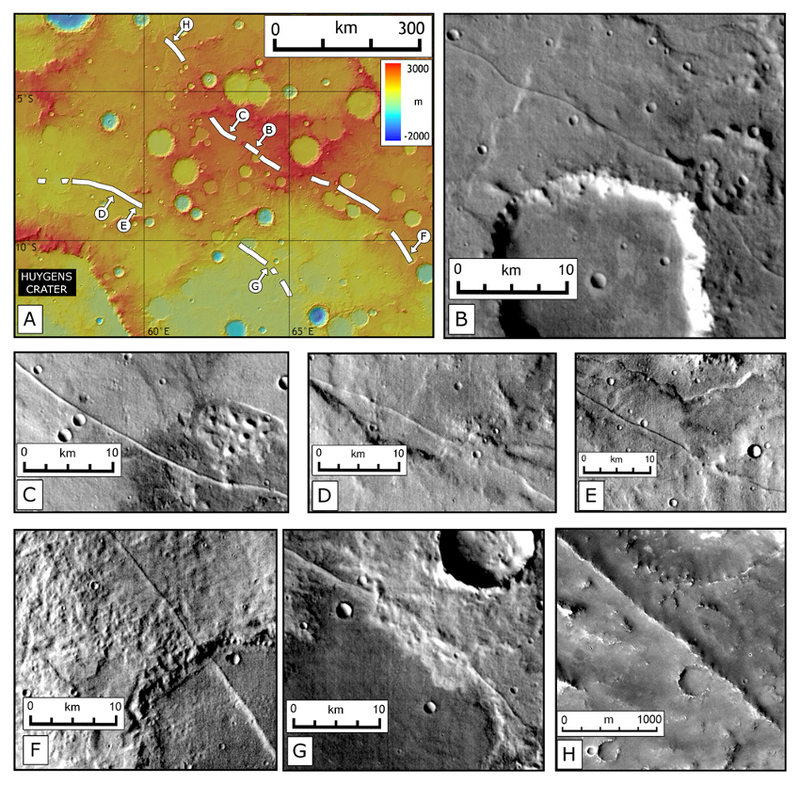 Head, J. W., L. Wilson, J. Dickson, and G. Neukum (2006), The Huygens-Hellas giant dike system on Mars: Implications for Late Noachian-Early Hesperian volcanic resurfacing and climatic evolution, Geology, 34, 285-288. Download pdf here. Hess, P. C., and E. M. Parmentier (1995), A model for the thermal and chemical evolution of the Moon's interior: implications for the onset of mare volcanism, Earth and Planetary Science Letters, 134, 501-514. Hess, P. C., and E. M. Parmentier (2001), Implications of Magma Ocean Cumulate Overturn for Mars, Lunar and Planetary Institute Conference Abstracts, 32, 1319-1320. Hiesinger, H., and J. W. Head (2004), The Syrtis Major volcanic province, Mars: Synthesis from Mars Global Surveyor data, J. Geophys. Res., 109, 01004, DOI: 10.1029/2003JE002143. Ivanov, M. A., and J. W. Head (2006), Alba Patera, Mars: Topography, Structure, and Evolution of a Unique Late Hesperian - Early Amazonian Shield Volcano, J. Geophys. Res., in review. Kreslavsky, M. A., and J. W. Head (2002), Fate of outflow channel effluents in the northern lowlands of Mars: The Vastitas Borealis Formation as a sublimation residue from frozen ponded bodies of water, J. Geophys. Res., 107l, 4-1. Mangold, N., P. Allemand, and P. G. Thomas (1998), Wrinkle ridges of Mars: structural analysis and evidence for shallow deformation controlled by ice-rich dÈcollements, Planetary and Space Science, 46, 345-356. Moore, J. M. (1990), Nature of the mantling deposit in the heavily cratered terrain of northeastern Arabia, Mars, J. Geophys. Res., 95, 14279-14289. Mueller, K., and M. P. Golombek (2004), Compressional Structures on Mars, Annu. Rev. Earth Planet. Sci., 32, 435-464. Phillips, R. J., M. T. Zuber, S. C. Solomon, M. P. Golombek, B. M. Jakosky, W. B. Banerdt, D. E. Smith, R. M. E. Williams, B. M. Hynek, O. Aharonson, and S. A. Hauck (2001), Ancient Geodynamics and Global-Scale Hydrology on Mars, Science, 291, 2587-2591. Robinson, M. S., P. J. Mouginis-Mark, J. R. Zimbelman, S. S. C. Wu, K. K. Ablin, and A. E. Howington-Kraus (1993), Chronology, eruption duration, and atmospheric contribution of the Martian volcano Apollinaris Patera, Icarus, 104, 301-323. Scott, D. H., and K. L. Tanaka (1986), Geologic map of the western equatorial region of Mars, U.S.G.S. Misc. Inv. Ser. I-1802-A. Solomon, S. C., O. Aharonson, J. M. Aurnou, W. B. Banerdt, M. H. Carr, A. J. Dombard, H. V. Frey, M. P. Golombek, S. A. Hauck, J. W. Head, B. M. Jakosky, C. L. Johnson, P. J. McGovern, G. A. Neumann, R. J. Phillips, D. E. Smith, and M. T. Zuber (2005), New Perspectives on Ancient Mars, Science, 307, 1214-1220. Tanaka, K. L. (1986), The stratigraphy of Mars, J. Geophys. Res., 91, 139-158. Tanaka, K. L., and D. H. Scott (1987), Geologic Map of the Polar Regions of Mars, U.S.G.S. Misc. Inv. Ser. I-1802-C.
Tanaka, K. L., D. H. Scott, and R. Greeley (1992), Global stratigraphy, in Mars, edited by H. H. Kieffer, et al.pp. 345-382. Watters, T. R. (1993), Compressional tectonism on Mars, J. Geophys. Res., 98, 17049-17060. Wilson, L., and J. W. Head, III (1994), Mars: Review and analysis of volcanic eruption theory and relationships to observed landforms, Reviews of Geophysics, 32, 221-263.